The once-high approval ratings of President Moon Jae-in of South Korea have begun slipping, so he needs breakthroughs in relations with North Korea. The past few days have been a roller-coaster ride for President Moon Jae-in of South Korea. On Thursday, the United States secretary of state, Mike Pompeo, announced that he would travel to Pyongyang, the North Korean capital, this coming week, raising hopes that the trip would make progress in talks over denuclearizing the North and provide the rationale for Mr. Moon to advance inter-Korean relations. Those hopes were quickly dashed barely a day later, however, when President Trump abruptly canceled Mr. Pompeo’s trip. To many South Koreans, the zigzag was another sign of Washington’s poor coordination in its North Korea policy, and it left Mr. Moon with a difficult choice. If Mr. Moon ignores Mr. Trump’s unhappiness with North Korea and pushes ahead with his plan to open South Korea’s first liaison office in the North as early as this coming week — as well as meeting North Korea’s leader, Kim Jong-un, in Pyongyang next month — he could run the risk of creating a rift with Washington, the South’s most important ally. Any major cooperative deal with Mr. Kim would also prompt a backlash from Mr. Moon’s conservative enemies at home, who are always eager to portray him as a dangerous progressive. But postponing the inter-Korean projects, such as his plan to reconnect the two Koreas’ railways, would be a huge setback for Mr. Moon, who has vowed to take a “driver’s seat” in efforts to defuse the crisis over the North’s nuclear weapons development and build peace on the Korean Peninsula. Mr. Trump could have scrapped Mr. Pompeo’s trip in an attempt to gain quick leverage over North Korea, and the American president may revive it soon — just as he once canceled and then reinstated his summit meeting with Mr. Kim in June, said Kim Yong-hyun, a professor of North Korean studies at Dongguk University in Seoul, the South Korean capital. But if that turns out not to be the case, Mr. Moon could find himself in an awkward position when he sits down with Mr. Kim next month. Mr. Moon’s foreign minister, Kang Kyung-wha, talked with Mr. Pompeo on the phone on Saturday, expressing regrets over the cancellation of Mr. Pompeo’s trip. But the allies agreed to maintain “momentum for dialogue” with North Korea, Ms. Kang’s office said. The latest falling-out between Pyongyang and Washington came at a delicate moment in relations between Seoul and Washington. Mr. 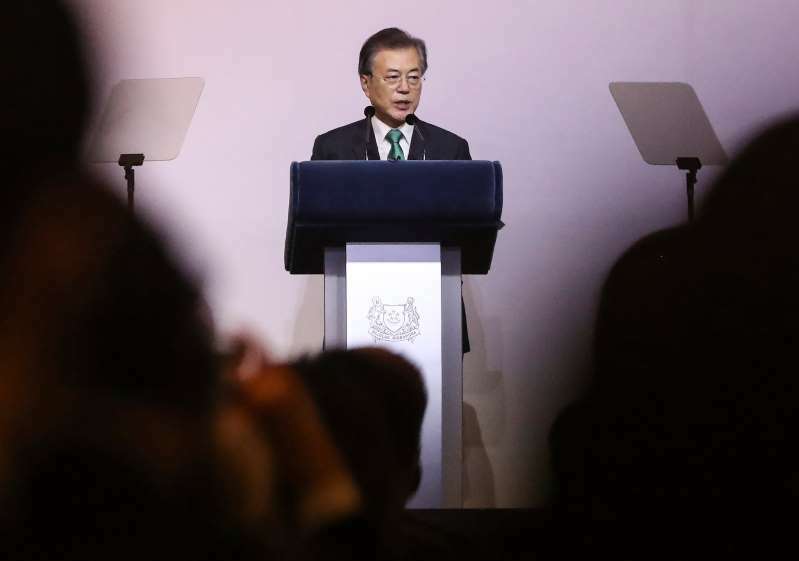 Moon recently delivered a nationally televised speech warning that his country could not remain a bystander as talks between Washington and Pyongyang stalled. That comment, coupled with Mr. Moon’s proposal for bold new economic cooperation with North Korea and his plan to open the inter-Korean liaison office, prompted worries among conservative South Koreans that Mr. Moon’s eagerness to advance ties would further complicate Washington’s struggle to persuade North Korea to denuclearize. In recent weeks, Mr. Moon’s once high approval ratings have begun slipping amid signs of rising public discontent about a slowing economy and high youth unemployment, so he needs breakthroughs in relations with Pyongyang. But to push for his inter-Korean economic agenda, he wanted relations between North Korea and the United States to improve enough to allow the easing of international sanctions. Officials in Mr. Moon’s government have often said that Mr. Trump’s unconventional approach may offer the best chance for diplomatically resolving the North Korean nuclear crisis, a problem that successive United States administrations have failed to address successfully. But South Koreans have learned how unpredictable it can be to maintain the alliance with Washington under Mr. Trump, as the American leader swung from threats to rain down “fire and fury” on the North to becoming the first sitting American president to meet the North Korean leader. But even after Mr. Trump and Mr. Kim met in Singapore and agreed to work toward the “complete denuclearization of the Korean Peninsula” and to build “new” bilateral relations, South Koreans have lived with an abiding fear about the fragility of the diplomatic process. South Koreans also worry that Mr. Trump will be distracted by his mounting legal problems at home or that he may not survive for a second term. A diplomatic process that Mr. Moon helped create could be quickly overturned, that line of thinking goes, if a new administration were to take office in Washington with a more skeptical take on diplomatically engaging the North. When Mr. Moon met with Mr. Kim twice this year, he emphasized how important it was for North Korea to move quickly to reach and carry out a denuclearization deal in return for improved ties with Washington while Mr. Trump was in office, so that it would be hard for future administrations to reverse the course. But things have not moved as quickly as Mr. Moon had hoped. Two months after the Singapore summit meeting, talks remain stalemated. Washington wants the North to make bolder steps toward denuclearization, such as revealing a full inventory of its nuclear assets and starting dismantling some of them. But North Korea says it will move toward denuclearization only in “phases” and insists on “simultaneous” reciprocal concessions from Washington, like the joint declaration of an end to the 1950-53 Korean War. “Kim Jong-un must be watching closely not only Trump’s legal problems at home and Moon Jae-in’s sliding popularity ratings as he calculates his next moves,” said Lee Byong-chul, a senior fellow at the Institute for Peace and Cooperation in Seoul. “Time isn’t on Trump or Moon’s side, considering both their political schedules, and throwing around the cancellation card too many times will lose its effect,” said Duyeon Kim, a Seoul-based researcher at the Center for a New American Security.